Most of us talk to several different people throughout our day. We share stories, ideas, and ask questions. But just because you’re having a conversation with someone doesn’t mean that you are being heard. Sometimes our speech patterns or the words we choose can get in the way of the idea we want to communicate. If our communications lack clarity, we might not be effective in getting our point across to others. Are there steps you can take to ensure that your conversations with friends, family, colleagues, and associates convey the meaning you truly intend? You bet there are! And I’m going to tell you about them. Let’s start with articulation. Being able to speak well is just part of the mix when it comes to being understood. But it is an important part. Ann Utterback, a broadcast voice specialist and author of Broadcast Voice Handbook, writes that “The best voice quality in the world is worthless if it is not articulated into words correctly.” For better articulation, completely pronounce each word. Don’t let the last letter sound drop off. Say each distinct sound or phoneme in the word clearly. Next, watch your pace. Use what you’ve learned about listening and observing non-verbal cues to determine if you are speaking too quickly. Pause between sentences or phrases and make eye contact with your listener. Slowing down when speaking allows your audience to catch up or respond. Remember, a conversation should include each participant. Pausing now and then is also a good way to assess whether your listener is still engaged in the discussion. Also, avoid information overload. The human brain can process information pretty quickly. But you can still trigger information overload in your listeners if you try to share too much information. Slowing your pace may not be enough if you are trying to communicate new or complicated information. To make your message more understandable, anchor new concepts with ideas that are more familiar. Varying the length of your sentences can also help make a complicated idea easier to receive. Finally, consider your audience’s needs. Have you ever completely misunderstood someone who was speaking sarcastically or used a word that you thought you knew the meaning of but had all wrong? Not fun. When we use slang, buzzwords, or other relaxed speech, it can sometimes be difficult for others to understand our meaning. Also, using unfamiliar words or telling inside jokes can leave some members of the group feeling left out of the conversation. Of course, there’s nothing wrong with including a few catchphrases or some slang in your presentations to add a little personality and pizzazz. Go ahead and let your personality show. Just make sure that the pizzazz you add isn’t interfering with the delivery of your message. 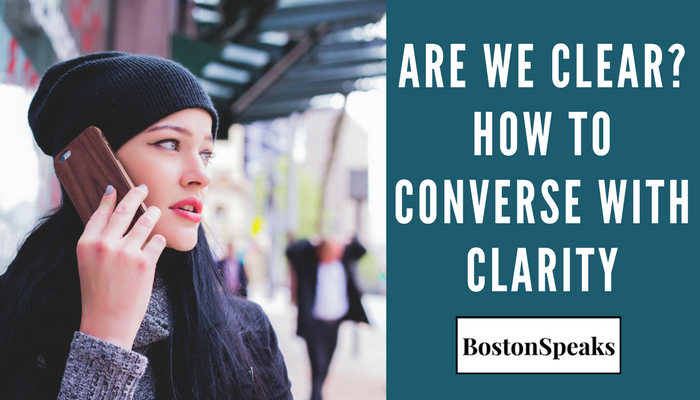 If you’d like to hear some additional advice on speaking clearly, check out BostonSpeaksTalks 003, with Karen Astin, The Quick and Dirty Guide to Speaking Clearly. Karen is a language coach with certifications in Speech-Language Pathology (SLP) and pronunciation to English as a second language learners (P-ESL). Karen is just one of the many great presenters who have participated in the BostonSpeaksTalks series. You can view the full line-up here.